You have probably heard of the popular saying "an apple a day keeps the doctor away", but how many of you have heard that drinking "a cup of green tea a day may keep the dentist away". Well, that's what the findings of a new research in preventive medicine proves. According to their research, drinking at least one cup of green tea a day increases the odds of keeping your teeth as you age. The researchers suspect the green tea to have certain antibacterial properties that helps to preserve the teeth. The antimicrobial molecules are called catechins that are present in the green tea, which may account for the green tea's benefits. These may be found in lesser amounts in oolong tea. But, in order to have the health benefit of the green tea, it should be had without sugar as adding sugar would negate the effect, as found by the team of researchers. According to the findings of the research study, people aged 40-64 who drank one cup of green tea a day were less likely to lose teeth. "Green tea may have bactericidal effects, which would affect teeth, but only if you drink it without sugar," said Alfredo Morabia, of Columbia University in New York and editor of Preventive Medicine, who wrote an editorial accompanying the new research." "They also reported that drinking sweet coffee was actually deleterious," he added. "Coffee alone had no problem, but sweet coffee would actually make you lose your teeth." The study was conducted by Yasushi Koyama and collegues of the Tohoku University Graduate School of Medicine who looked at more than 25,000 Japanese men and women between age 40 and 64. According to their findings the men who drank at least one cup of tea a day were 19 percent less likely to have fewer than 20 teeth (a full set including wisdom teeth is 32) than those who did not drink green tea, whereas the women who drank tea were found to have only 13 percent lower odds. "Previous research has indicated that regular consumption of green tea may lead to a lower instance of periodontal disease, a leading cause of tooth loss in adults," said Samuel Low of the University of Florida College of Dentistry and President of the American Academy of Periodontology in a statement to Discovery News. For a long time now, drinking green tea has been known to have certain health benefits associated with it, and now it's also been connected to dental health. So grab a cup of hot green tea, if you want to keep your dentist away. There is a general confusion between green tea and herbal tea, often interchanging the terms for one another. For those of you who want to know the difference between the two kinds of tea, let me explain further. The leaves of this tea comes from the same tea plant as the regular tea, namely Camellia sinensis. The difference here from the regular tea is in the way it is processed in the factory before it is brewed. The regular tea leaves are mostly dried and fermented, whereas the green tea leaves are steamed, which causes lesser oxidation than the fermentation process, therefore giving its unique green tint and higher levels of antioxidants than other teas. Green tea also contains some amount of caffeine like the regular teas, thereby having addictive properties. Green tea is popular in the Middle East and parts of Asia, including China, Taiwan, Hong Kong, Korea, Japan, India and Thailand. of different plants or may be a mixture of several plants. It does not contain any caffeine and therefore does not have any addictive properties at all. Drinking herbal tea also has several health benefits according to the ingredients present in the tea. 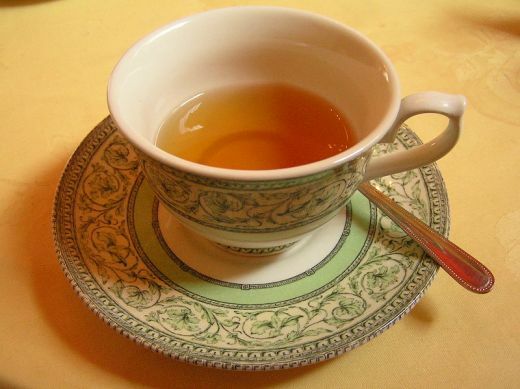 A cup of green tea will strengthen your teeth and gums. **The image above (A cup of Green Tea) has been sourced from http://s1.hubimg.com/u/3427416_f520.jpg, which has been attributed to Wikimedia Commons. Too late to take care of the previous damage but good to know for my kids and grandkids. Thanks. Thanks for dropping by, Theresa. Yes, indeed you could encourage your kids and grandkids to take better care of their teeth and gums. Though, I am sure you too could still benefit by trying to retain what's left in your mouth and postpone further damage, by at least a few more years.